Five hundred kilometres south of the Maldives, in the heart of British Indian Ocean territory, you’ll find the Chagos Archipelago. Home to the largest ‘no-take’ Marine Protected Area in the world, spanning an area the size of France, it is famed for the pristine coral reefs that fringe the 60 or so islands and a diverse marine ecosystem, most notably the sharks and rays that provide the National Geographic glamour. But very little is known about the oceanography of the region and the reasons it supports such an abundance of marine life. So when two academics in the School of Biological and Marine Sciences were presented with an opportunity through the Marine Institute to join a select group of scientists on a research trip funded by the Bertarelli Foundation and the Foreign and Commonwealth Office, they were only too happy to sign up. Phil, and Dr Kate Adams, a postdoctoral researcher who joined the University from Oregon State in October 2014, flew out in January to join 12 scientists from a new Chagosfocused research consortium represented by a range of international organisations such as the Zoological Society of London and the University of Western Australia – each researching a different scientific discipline, from acoustic mapping of zooplankton to manta ray tagging. They then departed from the United States’ military base Diego Garcia on their ‘research vessel’ – the patrol ship that monitors the area for illegal fishing. It’s wonderful that researchers from the Marine Institute in Plymouth, a city of which I have fond memories, were able to join this expedition. We’re delighted that Phil and Kate are both furthering our knowledge of Chagos – one of the world’s most incredible places – and helping to protect the oceans for future generations. While collecting measurements throughout the archipelago, they were especially interested in the edge of a seamount, a 100-metre deep area where previous measurements have shown huge aggregations of fish and an abundance of sharks. They deployed a range of sensors and acoustic devices to measure water currents, temperature, salinity and turbulence to identify the processes responsible for creating such a rich and abundant ecosystem over the seamount. This included a Minibat – a vehicle towed behind the boat that undulates between the surface and a programmed depth – which helped them look for evidence of periodic ‘up-wellings’ of cold, nutrient-rich water from the deep ocean onto the seamount plateau, where the sunlight might trigger photosynthesis and plankton blooms. They also used the holographic camera designed by colleague Dr Alex Nimmo-Smith to visualise zooplankton in the water, the results of which provided insight on the feeding habits of the manta rays. And it was not just manta rays that they had a close encounter with – there were some other, toothier species as well. They also had the opportunity to visit some of the islands and learn more about their history, including seeing the remains of buildings used by the Chagossians before they were ‘evacuated’ in the 1970s and relocated thousands of miles away. As is the policy for such cruises, a Chagossian descendant was on the trip with them. 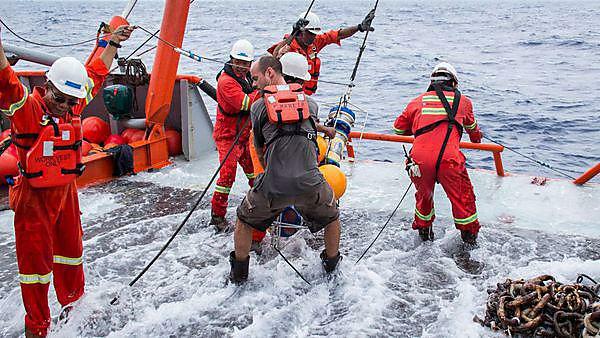 Phil is now writing proposals to NERC to undertake further research in the Indian Ocean, and following the success of this expedition, the marine physics team’s capability will be part of discussions on how Plymouth University can support a long-term international programme of research in Chagos.